APTI stands for Association of Pharmaceutical Teachers of India, and was started way back in 1966, by Indian pharma stalwarts including Dr. M L Schroff et al. 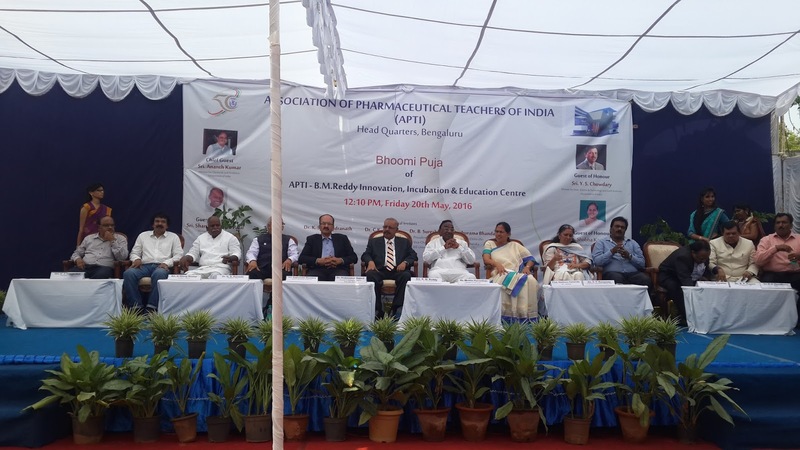 APTI has several dedicated persons working for enhancing pharma education and interaction with industry. The recent function of APTI: foundation stone laying ceremony (bhoomi pooja) on 20.5.16 for the APTI-B M Reddy Innovation Incubation & Education center, Bangalore, was truly inspiring. Dr. Shivananda (seated second left), Past Principal of Al Ameen College of Pharmacy, Bangalore, a dynamic "ageless" dedicated pharmacist teacher insisted on my presence at this function, and thanks to him I got a glimpse of how visionary educationists, regulators, industry doyens and politicians are working in concert to strengthen contributions of pharmacy education field to the pharmaceutical domain. 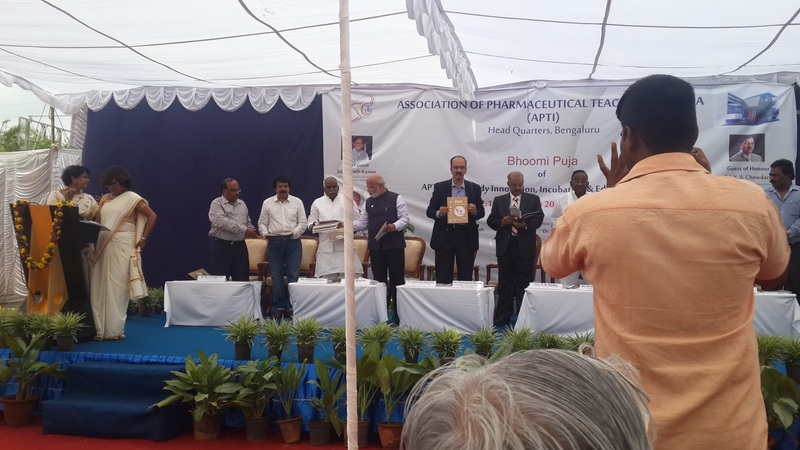 In the above photo, we see several captains of the pharmaceutical sector including Mr. Gundu Rao, businessman and President of Karnataka State Pharmacy Council; Mr. Raghuram Bhandary, Drugs Controller of Karnataka; Dr. Mohd. 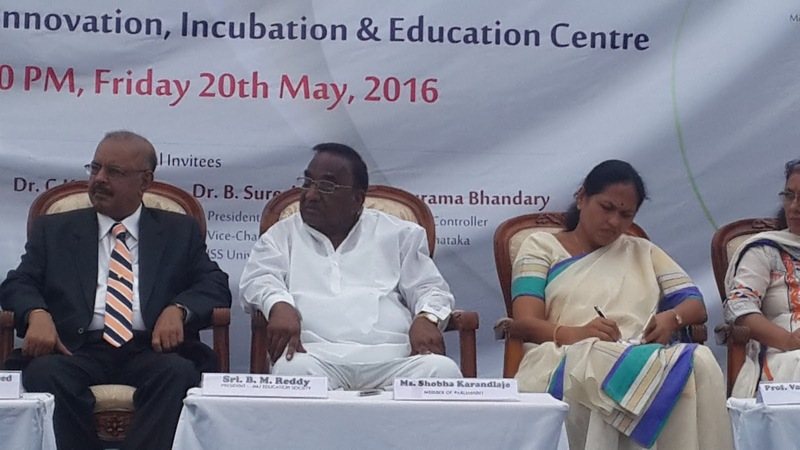 Majeed, MD, Sami Labs; Shri B M Reddy, founder of Acharya group of institutions including the pharmacy college; Mr. Narayana; Ms. Shobha Karandlaje, Member of Parliament, Dr. B P Nagori and others. The other VIPs graced the auspicious occasion as part of the audience: Dr. Mudda, Director of Global Strategy Micro Labs and the luminaries of KDMPA: Mr. Sunil Attavar, MD, Group Pharmaceuticals; Mr. Harish Jain, Director, Embiotic and Mr. Jitesh Sheth, MD, Shrusti Pharmaceuticals. Mrs. Nandita Vijay, the evergreen lady from Chronicle Pharmabiz known for her accurate reporting, lent her quiet dignified presence. There were many other education entrepreneurs, academicians and technopreneurs; students, teachers and faculty. 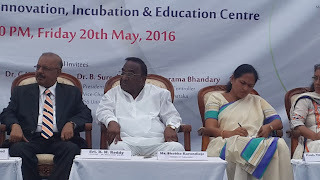 This incubation center is a Rs. 60 crores (Rs. 0.60 billion) smart building project, which will house state of art laboratories, seminar halls and amphitheatre facilities to encourage research, sharing, learning and innovation. Of course, the challenge is project execution, subsequent maintenance and finally ensuring that the center does produce value outputs...and not remain an ivory tower establishment. 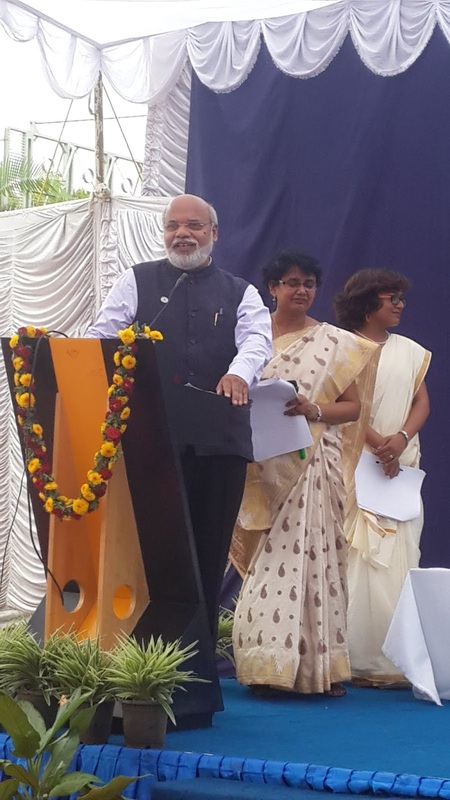 Certainly, a project and program driven culture will help make the new APTI B M Reddy center a relevant institution. of which Acharya & B M Reddy College of Pharmacy, Bangalore is a well-known one. 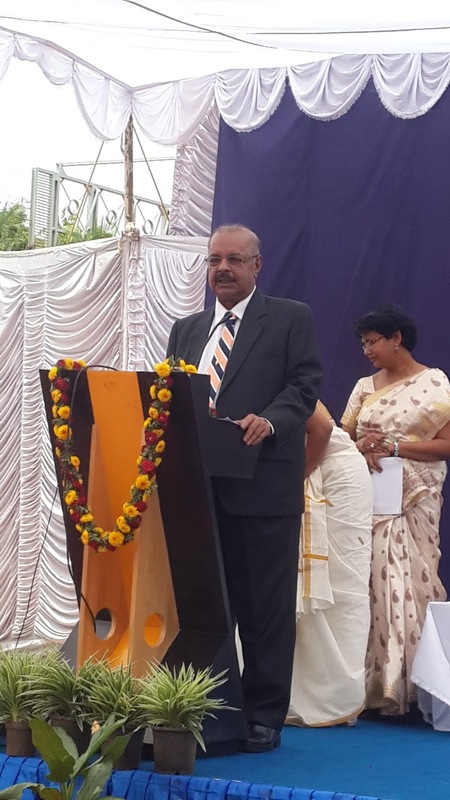 Mr. B M Reddy, a very down to earth education entrepreneur, has donated one acre of land (worth currently approx. Rs. 20 crores or Rs. 200 million) is a visionary leader. After the APTI B M Reddy incubation center gets going, the aura and brand recall for his pharmacy college among opinion builder pharmacists (such as teachers) will obviously increase. Journals and other publications were released at the function: here Dr. Raghurama Bhandary, Drugs Controller of Karnataka is seen in action. All in all, the event was a memorable one, as a fellow pharmacist I hope it augurs well for the profession, through this new institution: APTI B M Reddy Innovation, Incubation & Education Centre, in the making.﻿ This event reflects the current state of affairs: India is agog with action in almost every field IT, agriculture, medicine or pharmaceuticals. Professional and knowledge working has become order of the day.